Overnight Wednesday Night: Cold and clear. Lows dropping into the 20s. Tomorrow (Thursday): Sunshine to clouds building in. Highs near 50. Did it snow in your town last night? Much of interior Southern New England saw snowflakes mixing in, and in some cases changing over entirely, for a brief time Tuesday night. Behind that disturbance has come a reinforcing shot of fall chill, holding today’s high temperatures in the 40s with wind chill values only around 40 at the warmest time of the day. Stubborn clouds have been the result of cold air moving across our relatively warm ocean waters and creating ocean-effect clouds ... with earlier morning ocean-effect rain showers now gone from the South Shore and Cape Cod. Expect a cold night tonight – freeze warnings have been issued for South Coastal areas that have escaped a deep freeze up until now – with lows in the 20s. Thursday brings slight moderation as most of us will make a run at 50 degrees ahead of a powerful cold front that will deliver a round of Thursday evening and night snow squalls to Northern New England, and a rain squall for the rest of us. The snow squalls in the North Country will drop one to three inches of snow on snowmobile trails in the far north – not enough to fire up the engines but enough to ring the starting bell, at least, and will make some roads slick overnight into early Friday morning. 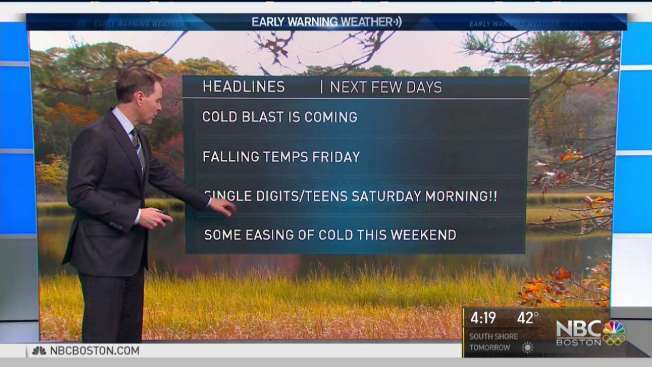 All of New England feels the impact of the cold front by Friday – highs only in the 30s with a wind chill in the 20s most of the day! Equally cold air persists Saturday, but with less wind, ahead of some moderation Sunday and a returning chance of showers to start next week in the Early Warning Weather 10-day Forecast.